Innovative Educators understand the value of high-quality professional learning opportunities. They take what they learn and put it into practice in their schools and classrooms. I had the opportunity to connect with innovative educators who did just that during the annual Maker Faire at The Ovington Tinkering School in Brooklyn. At this school their motto is “Tinkers are Thinkers.” This Faire was conducted to showcase the work of all the tinkers who make up the school. But if it hadn’t been for the technology professional learning opportunities they attended, students never would have had the opportunity to dream big and engage in work that is worthy of the world. 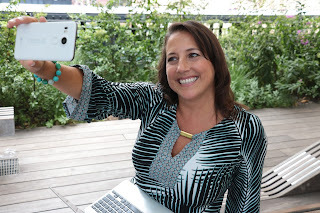 From there Culkin and her staff attended more tech summits, faires, workshops, camps, and certification programs to hone their craft and bring their learning to life in their school. The school's Tech Specialist, Stephen Amachee explained that one of the reasons he finds these workshops so valuable is that all material is available to participants digitally. Presentation materials, handouts, etc. That makes teaching the workshop back at their school to even more teachers possible. In between these learning opportunities, the staff also turns to the power of their district’s online learning community #NYCSchoolsTech which connects tech learners and lovers (and those who support them) across New York City schools. There they receive ideas for inspiration and instant feedback for any questions or concerns that may arise when bringing what they learned back to their work. As a Teachers College Reading and Writing Project school, the staff teaches students that their work and voice can have a positive impact on the world. The MakerFaire embraces that idea and highlights the school’s four core areas of focus where students aim to positively impact the world: Sustainability, engineering, robotics, and coding. You can take a look at the innovative projects the students created in the photos below. What do you think? How have you been inspired to bring back to your work, what you have learned during professional development opportunities? If you haven't heard, and it's likely you haven't, Microsoft launched a product called Teams in 2017 following the company's decision not to sink 8 billion dollars into the purchase of Slack. Instead, they decided to build out their Skype product and develop their own version of Slack. This is not good news for Slack. What it means is that institutions who already have O356 subscriptions will have access to Teams included in their subscription. However, when launched, Teams was a weak and buggy product. So Slack didn't have much to worry about. In the meantime, Facebook crept into the game as well offering a product called Workplace that looks, feels, and functions just like Facebook. No learning curve and it provides an intuitive ease of use. This meant companies like Walmart and Starbucks moved onto the platform as well as several non-profits and educational institutions who have access to the platform for free. But, the problems Facebook is facing in the news, and the fact that they won't guarantee free forever for education, makes Workplace a less desirable choice for some. Which to choose? Slack, Workplace, or Teams? So, what to choose if you're an education institution? Slack? Expensive. Workplace? Not free forever and legal issues. Teams? Buggy and weak. However, it seems Teams is making a move to get into the game and become a more serious contender. 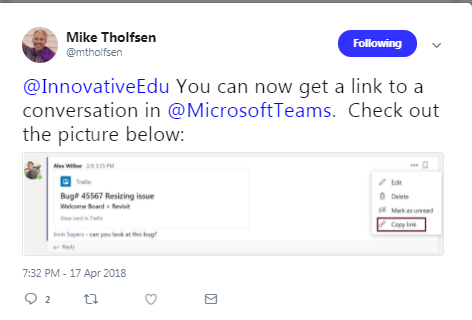 I had complained to teams project manager Mike Tholfsen that even after they fixed the bugs and got features running, one big reason I wold never recommend Teams is because you are unable to link to a post. This is an imperative feature that no group moderator would want to live without. The absence of this feature means there is no way, other than sifting through hundreds or thousands of messages, to refer to a post. Well, that issue has has finally been addressed putting teams back in the running. Teams still needs a lot of work. For example, it tries too hard not to be like Facebook so names are listed with an impersonal last name before the first name. You have to scroll to the bottom of a thread to add a message. Messages are listed from oldest at top to newest at bottom. It is also missing the important polling feature. Yes, there is a clunky process to add on polls, but it should just be a part of the platform. That said, for companies who already pay for O365, and are looking for an internal communication platform, Teams is on its way to becoming a viable online community that also now has video and phone conference features embedded (can be scheduled or instant), the option to have topic-specific conversations (called channels), and the ability to instant message. What do you think? Have you used Teams? If so, what did you think of it? Did you like it? If not, would you? Why or why not? Kids today are living in a world more connected than ever before. They are living in a world where they can harness the power of social media for social action and they are doing that in ways many adults could never even imagine. As innovative educators we do our part to help our students become empowered digital citizens, but it's not just our responsibility. 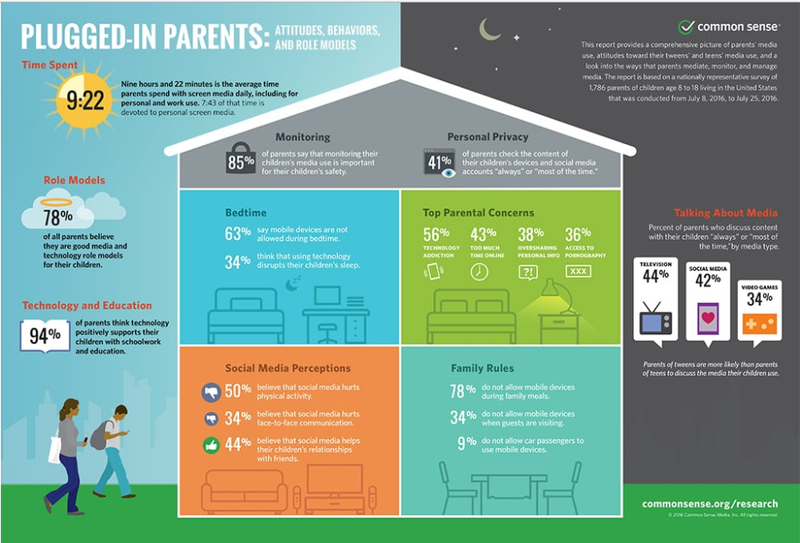 Parents want to help their children engage effectively in today's digital world, but many just don't know how. Fortunately, Common Sense Education has some amazing resources to help remedy that and lucky for you, I've compiled them all in one place. 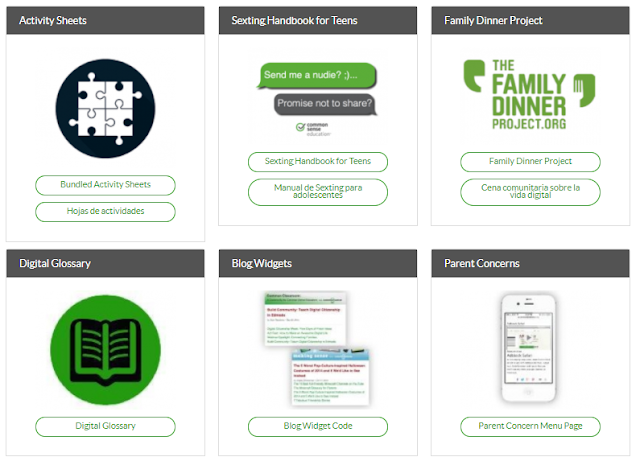 As part of their Plugged in Parents, Common Sense has put together resources to present a "Parent Talk." The talk provides audiences with a general overview, a sense of Common Sense's approach and tone, and information around highlighted topic to use during the Q&A part of the presentation. There is also some additional content and links to share with parents if they ask. This free, yearlong program includes everything parent facilitators need to encourage their schools and communities to use connected technologies in ways that are both fun and safe. Resources include a step-by-step hosting guide, conversation topics, and printable resources to share -- all carefully researched and crafted by Common Sense educational technology experts. 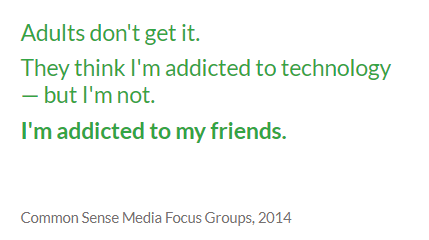 Digital Life Survey: A simple survey of the school community's daily use of and attitudes toward media and technology. 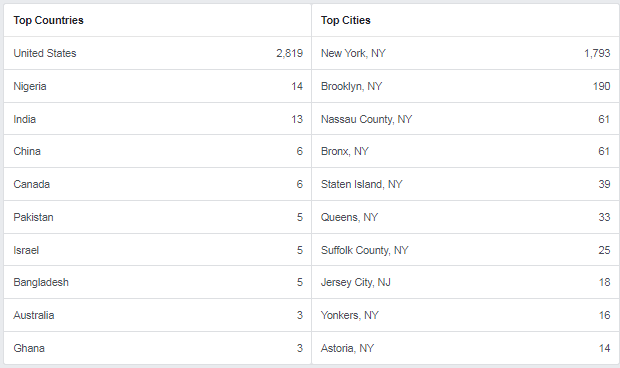 You can share the results to generate a buzz and ongoing conversations about your community’s behaviors and opinions. Video Discussion Night: Invite families to drop in for a brief parent coffee, grade-level assembly, or school-wide community meeting where a short video is used to spark a dialogue. This comes with a guide packed with everything you need to host a successful discussion. Teen Panel: Our kids are often the experts. The teen panel highlights the unique voices and experiences of teens in your community and is valuable to parents with kids of all ages. It comes with a comprehensive handbook that focuses on every detail from how to select and invite panelists, to how to manage Q&A on the night of the event. 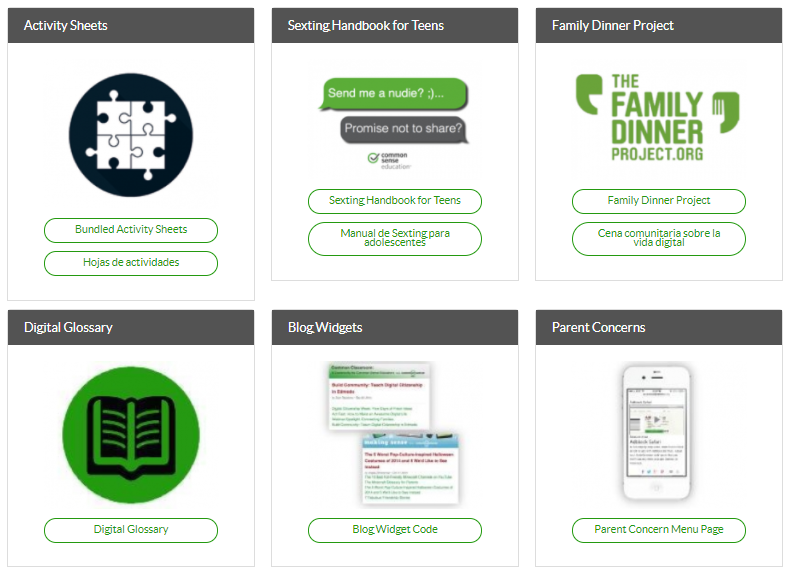 Facilitate parent discussions with our Conversation Cases. Each topic includes a real-life example, question prompts, and materials for facilitators and participants. Below is a sampling of conversation topics. What do you think? Are these resources you have or would use where you teach? What do you think would work best? What would be challenging? Not sure how to organize a workshop in your school. Read this article from innovative educator, Craig Kemp. If you are an innovative educator who values building community and meaningful connections among peers, it is likely you have had experience moderating groups. 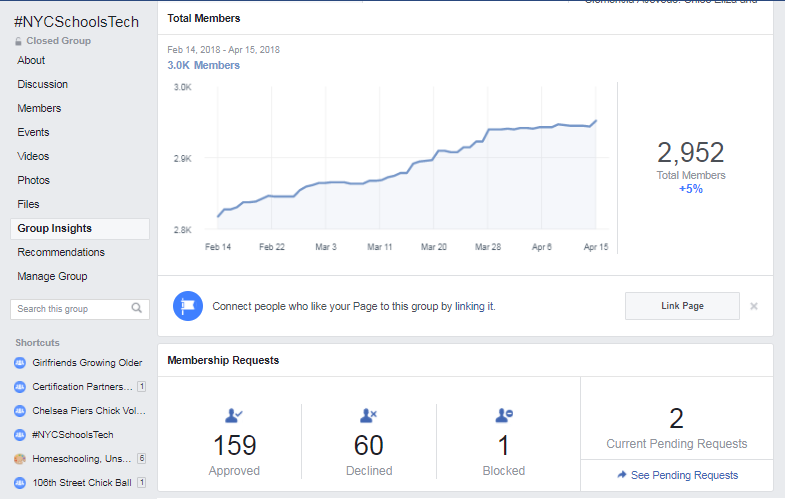 A successful moderator spends time analyzing their group, and in the past year, Facebook has made this a lot easier to do. 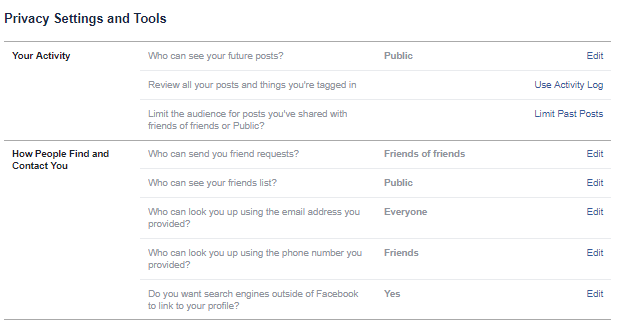 Now, rather than having to hire an outside company, Facebook gives you the tools you need. Here is what you'll find when you look at group insights. 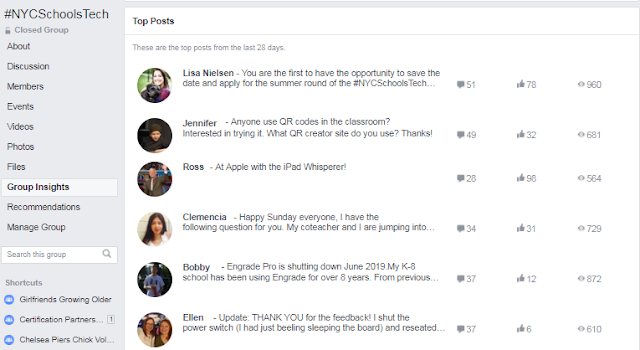 The first screen you will see provides an overview of group members, indicates top contributors, and gives stats on posts, comments, and reactions. You can dig deeper into each metric. When you click on "New Members" you can see the total number of members as well as those who were approved, declined, and blocked during the past month. You can also see how many members in your group are active. 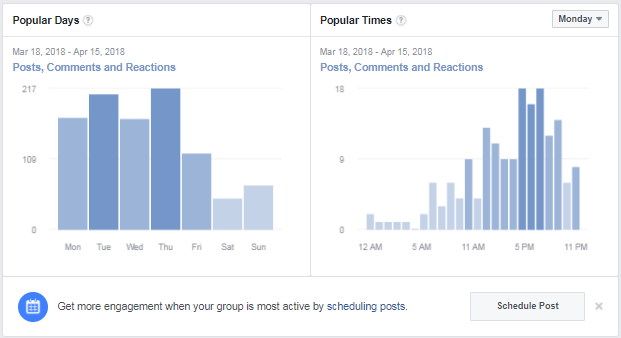 When you select engagement details you can see the top posts. If you have a very active group with many posts, this is a great place to go to prioritize where you focus your attention. Reviewing this can give you great insight into the topics and issues that are important to your members. You can see which days and times members are most active. This is useful information if you plan to schedule posts with which you want members to see and engage. More member details provides demographic information such as age, gender, and location. 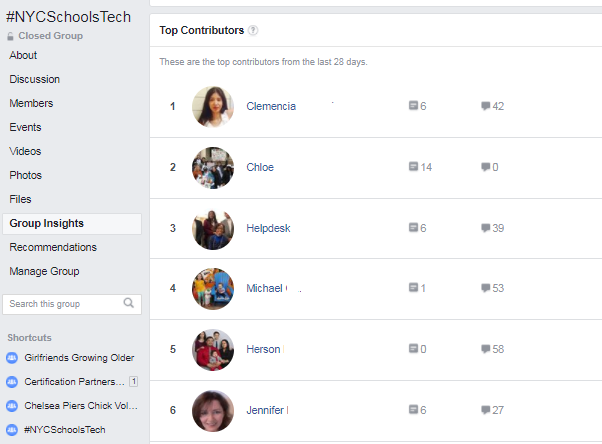 You can also see who your top contributors are so you can give them a shout out, honor, or recognition. While for the past decade Facebook has been focusing on "Making the world more open and connected," they are changing course. Mainly because that focus had a fundamental flaw: it didn’t push for any specific positive outcome from more connection. This past year, during their community summit in Chicago, Facebook CEO Mark Zuckerberg revealed a new mission statement, to “Give people the power to build community and bring the world closer together.” Groups are the resource to do just that and group insights are among the management tools to allow this to happen effectively. 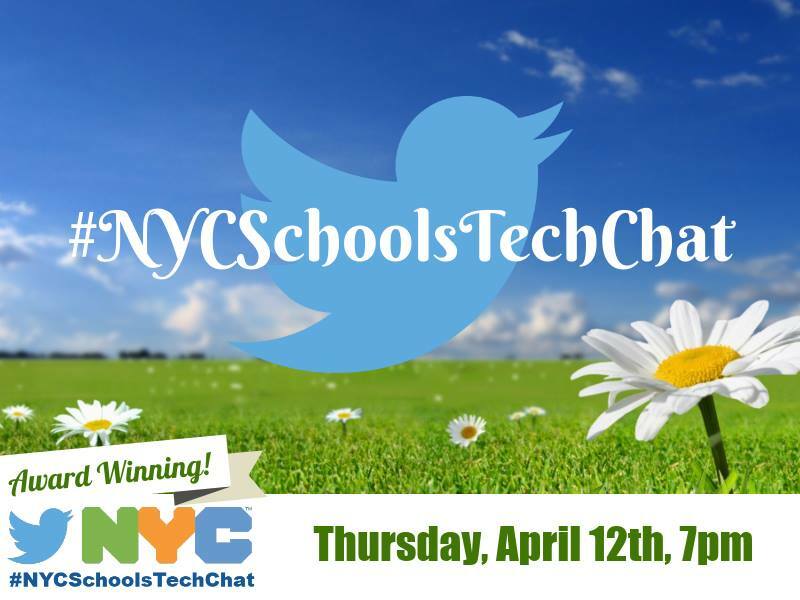 During this month's #NYCSchoolsTechChat we will address practical ideas and approaches teachers can use to ensure students receive instruction and resources necessary for financial success. 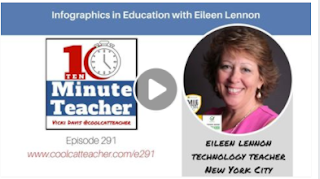 #NYCSchoolsTech teacher Eileen Lennon moderates with me throwing in my two cents. Q6 Give a shout out by RT, like, or reply to someone who has inspired you in today's #NYCSchoolsTechChat on #FinancialLiteracy during this #FinLitMonth? 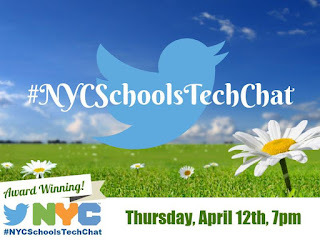 We hope you can view the chat live, but if you are unable, please visit our archive at https://www.participate.com/chats/nycschoolstechchat. You can also participate in the chat at that link or download the app at https://www.participate.com/apps. Not a problem for me. If I want to see depressing posts, I know where to go. If I don't, I know how to unfollow people and still stay friends. I know how to see more of what I like. I know how to ensure I'm not just in an echo chamber by ensuring I am seeing ideas and insights from those who are different than me from around world in ways never before possible. Privacy is a myth in today's world. Anyone who engages in the world today knows that privacy has been redefined. I don't expect what I post to be private. To remind me of this, I don't try to play with the privacy settings. 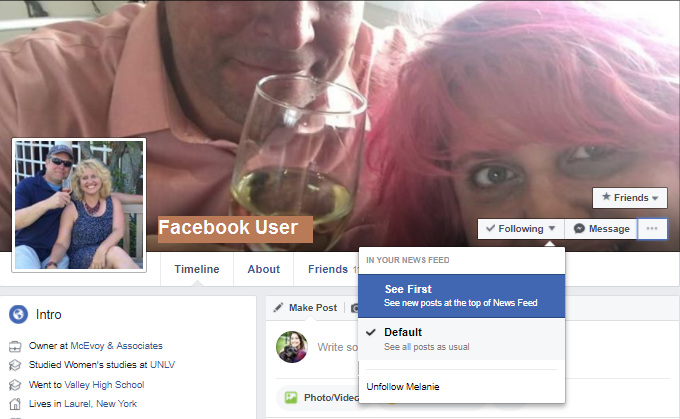 Instead, when I go to the small, blue triangle on the top right side of my Facebook menu bar, I go down to "settings" then "Privacy." From there, I just make my posts public. When I share, I post ideas that others might find helpful, funny, inspiring, thought-provoking, cute. I usually don't post anything I want to be private, but if I am compelled to do so, I know there is a risk and I'll have to live with that. I also know that while I am able to control what I say about myself, I don't want to entrust others to do the same so I limit some of what others can do on Facebook such as tag me in a post without approval. Yes. Of course there are targeted ads based on my use of Facebook. I don't pay for Facebook, so I expect they'll use my habits to target ads and a lot of times, I'll pay Facebook back by buying what I see being advertised. Yes. Facebook knows about me and it uses what it knows to sell my data. It knows the things that others who know me, may perceive or pick up on like I live away from my hometown, work in education, travel, and am likely to engage with liberal political content. It knows habits I may not even have been aware of like that I have a lot of close friends who are expats and my multicultural affinity is African American. Facebook is interested in this, as stated above, because it makes money off of targeting ads, just like Amazon knows what I like based on my purchasing habits. I am who I am, and I don't mind if others know it or use it to tailor marketing. I find it surprising that anyone would be shocked about this. It is the tradeoff for free services. 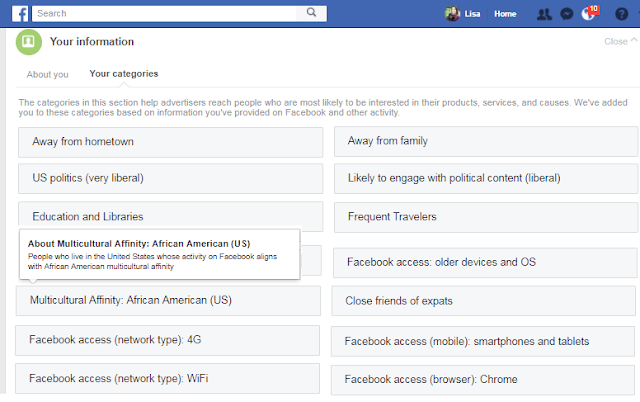 To view how Facebook labels you, go to settings>account settings>ads>your information>your categories. Facebook provides the best way in human history for people to stay connected. There are tons of benefits to having ties to family and friends. With Facebook, teary goodbyes as you are off to college or off from college are a thing of the past. Facebook lets you keep up with hometown friends, old high school buddies, former students and colleagues. You can stay connected with those you want to and, of course, block or unfollow those whom you don't. Even if you don't want to use Facebook for some of the features, by simply putting your name and photo there as billions have, it eliminates the need for the old school phone or address book that were always out of date. Facebook provides an efficient and effective way to connect to experts and officials and provides a more powerful way for these people to interact with followers. The experts can poll followers, put out posts to which they can respond and engage, and do live videos in which they can respond and interact with comments from followers. Did you know that if you use Facebook you don't need to pay for phone service? While this may not seem like a big deal for some, it is for low-income users who can save a substantial amount on monthly phone bills. Choosing between staying connected and eating should never have to be a choice, and so many of those in this situation know it is not with Facebook. Facebook enables users to make video calls with up to 50 people. Unlike other services, Facebook works on any device or platform. This is not true with most competitors such as Skype or Facetime. When Facebook came on to the scene, Evite quickly became a thing of the past for master organizers. When it comes to organizing and events, Facebook rules. Whether you take poll to see who is available or who will bring what or use the event function to see who is attending and let others see as well. Not only is the organizer in the know but those participating can help and connect in powerful. ways. Relationships are one of the most important parts of life and there has never been a better relationship-building tool than Facebook. I have worked more than 20 years as an innovative educator in New York City. For most of my career I worked in isolation. There was usually just one person like me (tech teacher, library media specialist, tech coach) in each school. It was difficult to connect and share ideas. Difficulty in connecting with others who share your interest is a thing of the past. We get to meet the minds of others before their faces and stay connected and keep the conversations going after we've met face-to-face. This allows powerful connections and relationships to develop that in my case make the lives of children better. No. Don't "trust" Facebook. Question it. Think about its motives. Talk about it. Make smart decisions. Support the lawsuits that question its motives and result in change. Facebook is a business. Among others, we are the clients. 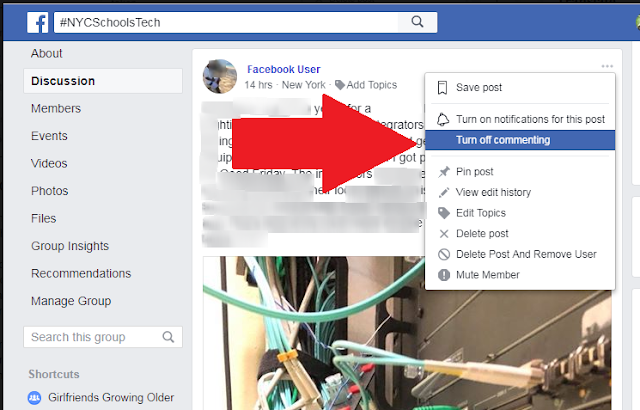 Be smart about how to make Facebook work for you. What do you think? Do the benefits of Facebook outweigh the drawbacks? Have people you've known left Facebook who could have just adjusted their habits and decreased the drawbacks while enjoying the benefits? What are your recommended best practices on Facebook for yourself, your students, and their families?